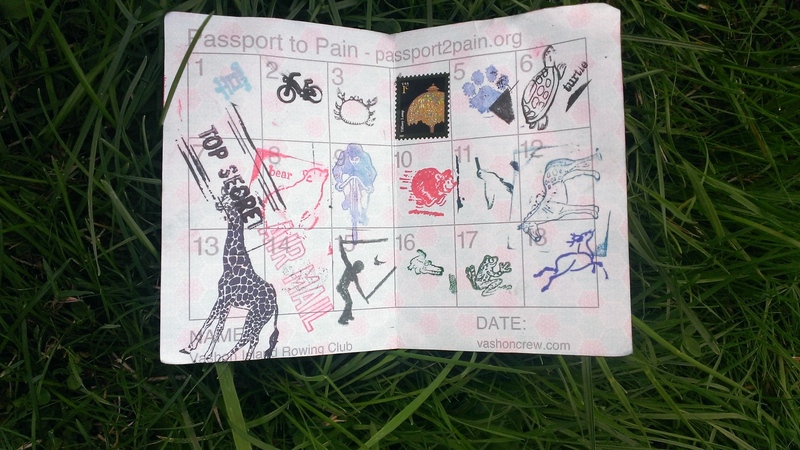 In my continuing quest to do stupid things, I signed up for the 2013 Passport2Pain. This ride is a fundraiser for the Vashon Island Rowing Club. Apparently, the club was sitting around one day and said, “let’s do a cycling ride to raise some money for the club”, and a plan was formed. They quickly agreed that the ride should be “hilly”, but were unable to agree which hills should be included. The impasse was finally broken when somebody suggested, “let’s just do all of them!”. And the Passport2Pain was born. Okay, those aren’t the real route names; I’ll explain the real route names as we go along. I will note that the short ride appears to be roughly comparable to the very popular “7 hills of Kirkland” ride, though I have reason to believe that many of the hills are worse than those on 7 hills, and the longer routes are clearly much worse than the 7 hills metric and full century. I thought I would try something different, and actually do some training for this ride, so I’ve been spending some time in the hills recently, including a trip up the ever-unpopular Montreaux-Zoo hybrid last weekend, and I also did a couple of hard 3500’ HC climbs on my recent vacation. Having said that, I’m not a natural climber, and I rode a little harder this week than I had planned, so – as usual – I’m not really in the form that I would like to be. Stava says that my fitness is near 60, which is pretty much my peak for the year, but it also says my fatigue is 60, so my form is a neutral 0. The ride starts at 8AM, and I want to start pretty close to that time, so I get up at 5AM. The start isn’t very far as the crow flies (why is the benchmark a crow? why not the pileated woodpecker? ), but there’s a ferry ride in the middle and I want to make sure I catch the ferry I want. A quick breakfast, I get dressed, and then I grab my riding bag (a cloth shopping bag that holds my usual stuff; shoes/helmet/gloves/arm & leg warmers/thin coat/booties/etc. ), my food bag (two baggies accelerade, tube of mixed Nuun flavors, cheese-its, garlic naan, shot blocks, two honey stingers, camera), and my water bottles (Camelbacks), and head out to the car. It’s 5:53, and there is a slight mist in the air. The trip there is mostly uneventful. I chat with some friends while waiting for the ferry about what is coming. I catch the ferry I want to catch, and get to the start at about 7:30. I pull the bike out of the car, get it ready (GPS, phone, wallet, keys, water bottles all in the right places), and proceed to have a discussion with myself about what I’m going to wear. The ideal amount of clothing is such that you are just a tiny bit chilly when you start. If you wear too much, you get sweaty, and then you get colder. If you take it off, you are stuck trying to carry it around. I have a vest and coat that pack up very tiny, but I have pockets full of food, so I don’t want to take up the space. I finally settle on a pair of arm warmers, and ride over to the start area. As I ride in, I pass a guy wearing the full Liquigas Polka dot jersey Kit, including the shorts. It looks something like this. During the Tour de France, the different leaders wear distinctive jerseys. The overall time leader wears the yellow jersey, the points leader wears green, the best your rider wears white, and the rider who has performed best on the climbs is “King of the Mountains”, and wears the understated polka dot jersey. The other big races of the year (the Giro d’Italia and the Vuelta de Espanaa) use their own color codes. In the tour, possessing the jersey is an honor – some cyclists may go their whole career and ride many tours without ever wearing one of the jerseys. It is to be respected and not used frivolously. When somebody shows up in a polka-dot jersey at a hilly ride, it’s essentially stating “I’m all that”, and a rider that chooses to do it should be able to back it up. Note that there is one exception to this guideline; if, for example, you are a guy who weights 250 pounds and has a visible beer gut, you are allowed to wear the polka dot jersey because it is clear that you are wearing it ironically. I find out later that the rider wearing the kit was local rider and fellow Microsoftie Larry Beck. He finished in 5:18, with an average speed of 15.2 MPH. I think that classes him as “doing the jersey honor”. Anyway, I lean my bike against a convenient trailer with rowing shells on it, wait in line to use the facilities, and then head to check in. To register for the ride costs $100 – which is a lot of money, even for a fundraiser – but the organizers have come up with an interesting way of making it accessible for those who have less free money. As we ride around, we will get our passports stamped, and at the end, you can get a $4 rebate on your registration fee. Hit all 18 checkpoints, and you can get $72 back, making the cost only $28. Or, you can choose not to ask for the rebate. I have opted to go “all-in” (no rebate), and the organizers have kindly given me a separate registration line. I pick up my course map, my passport (in a ziploc because it’s going to live in a sweaty jersey pocket), and a single “P2P” sticker for the front of my helmet. About this time, the ride director calls us over for a rider meeting. He tells us that the course has a slight detour, missing one hill because of construction, but we can double one if we’d like. He tells us about the roads (not wide), the pavement (poor in places), the descents (windy (as in “lots of turns”, not as in “lots of fast-moving air”)), and the residents (nice). He tells us how the start will work so we don’t put a huge group of riders on the road all together. Another benefit of those who went “all-in” on their donation is that we get to start first. There are a lot of us, so they will send out 5 riders every minute (I think they could probably do it every 30 seconds and it would be fine). I have cleverly put my bike right near the front of the start group, so I roll out as the 10th rider on the road. My plan for the day is simple. I’m going to ride the first section of the course, and then, when I get to the turnoff for the short course, I’m going to do a quick evaluation of how I feel, and then decide. If I keep riding, I’ll make the same decision at the medium course. My *prediction* for the day is that I’ll do the short+medium sections and skip the last loop. But who knows – I might surprise myself. We head out, off the little Island where the start is, and head up our first hill (all of 75’ of climbing). I’m spinning and trying to warm my legs up a bit. I worked out a little harder than I had planned the week before, but my legs feel okay. We end up on the main North/South road, and then turn off on our first descent, and at the bottom, find the first checkpoint. I get my passport stamped, and the little chinese character looks very lonely, one box filled on a page with 17 empty boxes left. We head up, and the pitch quickly increases to 13% or so. I’m running in my lowest gear (30/28), and looking at the others around me, most people have chosen some form of mountain gear. The few that haven’t are in for a long day – or perhaps a short one if they only do part of the ride. The weather is misty up near the highway, and mistier when we’re down by the water. I’m a little wet because of it, and my sunglasses have beads of water on them. It’s a little chilly on the descents. I believe this is known as “typical Vashon weather”. It’s back up to the highway, and a nice long fast descent. I’m thinking that this won’t be too hard to climb back up. A bunch of riders at the turnoff make sure I don’t miss it, and I turn onto a curvy road that descends a bit more. I’m looking to the left, searching for a checkpoint as the road bottoms. There is no checkpoint, but there is a nice steep hill in front of me. The garmin says 18% as I stand to attack it. On the other side, we keep climbing away from the water, and finally top out at the top of a small climb at checkpoint #2 (bicycle stamp). We retrace our path and head north on the island. This is what I call a double; the route to the checkpoint and back to the main route involves not one, but two separate climbs. Rest assured, dear reader, that I am not going to recount in detail the remaining 16 checkpoints for the ride. I think I could, but I’m pretty sure we would both find it pretty boring. I will therefore just give you the highlights. At this point I hear a familiar voice, and find that it’s Jeanne, who rides with our group. We ride together for a while and chat, and then, on the next hill, her natural riding talent leaves me behind. I ride on. There is now a decision to make. One can continue on the ride, or one can call it a day, and head back to the start on the aptly-named “The Weenie” route. I’m feeling fine, so I ride on. In the near future (the whole day has mushed together in my memory), I do a hill that has my Garmin reading 20% on the ascent. Soon afterwards, it gets scared and stops recording altitude all together; it does not show the incline, nor is it recording altitude gained. Everything else is find – speed, cadence, power. I turn it off, turn it on again, and it starts working fine. More hills, more checkpoints. The checkpoints are all staffed by volunteers; the stamping is typically done by young rowers (which is what the money raised is for), with a few adults. They are uniformly pleasant, each of them (the checkpoints, not the adults) feature something slightly different to eat, and when they (once again, the checkpoint) have cookies, they (this time it’s not the checkpoint, but the cookies) are generally homemade, and quite tasty. Because there are so many of them (checkpoints), I don’t really need two full water bottles, so I switch to just filling up one. I don’t need to carry an extra pound up these hills. We are now riding a curvy road (well, it’s more of a glorified goat track) that winds through the woods between the trees, and we come to a small sign that says, “Here is where P2P turns ugly”. Most of the hills we’ve climbed feature sections from 13-15% in gradient, and I am pleasantly surprised when I’m only climbing a 9-10% grade. And we’ve already seen some grades right about 20%. I wonder what “ugly” is going to mean; I’ve heard people talk about the “Burma Road” section, and I’m hoping this is it so we can get it over with. A one mile, 350’, 7% climb in Puyallup on the STP route. A short 1/5th mile climb up to the Sammamish plateau that averages 15% but tops out a bit higher (this is more properly known as “the gate”). I start the climb. I am in my lowest gear, and I end up standing and tacking back and forth to keep going forward. I watch the gradient numbers on my garmin spool up, and as they hit the mid-20s, I think “okay, 25%, I could believe that”. Then they just keep going up, ending up at 39%. The hill is steep – super steep – but I think the tree cover was messing with the Garmin, so I’m going to say 25%, and be done with it. There is more than one person walking their bike up it. This hill is followed by another that is just as bad. If any hill qualifies the “wall” designation, these qualify. And, so it continues. At one point, I think we’re heading down towards the ferry dock, which makes me happy, because the climb up from the ferry dock is supposedly only 9-10%, but then we turn off to the West, and descend down another way. The way up features another honest 20%. And another hill, and then we ride back into town. I run into my friend Joe outside of the bakery. We talk briefly, but I’m not very social on long rides. I lead Tue/Thu nights, and when I’m riding on the weekends I’d generally prefer not to have to deal with people much. There are two things I need. I need a bathroom – which I find behind the very busy farmer’s market – and I need some caffeine. I buy a diet coke (the fructose in real coke gives me stomach cramps) from the Thriftway and stand outside, chugging it down. While I am there, I am approached by a bee asking me if I know how to identify GMO foods. It is possible that it was a *person* dressed in a bee, but given my mental state at the point, I can’t make a definitive determination. I head out again, and the liquid and caffeine have helped me quite a bit, and I feel pretty good. My legs – which were hurting quite a bit after the Burma road section – have calmed down a bit, and the hills here seem to be content to limiting themselves to the 13% range or so. We do one section here (or perhaps it’s before town, things are a bit hazy) where, at the checkpoint at the bottom of the hill (I almost said “steep hill”, but that would be redundant here), near the beach, there is a sign that says “no guilt option”. It is pinned to the cushion of a nice chaise lounge underneath an umbrella; there are fuzzy slippers, a few books, and a cooler of cold beer. You can be done; all you have to do is surrender your passport, park your bike, and relax. This is manipulative and mean. I love it. We come to an intersection, climb up “evil twin #1” to a checkpoint, descend back down to the same intersection, and then climb “evil twin #2”. The past 3 checkpoints, I’ve been just ahead of a few guys from my group, and I keep expecting them to pass me, but we end up keeping the same gap. A bit of flat(ish) road along the water, and we come to decision point #2. The choice is whether to head straight towards the remaining checkpoints on Maury Island (I think there are 5 left), or to turn right, ride the mostly-flat section back to the starting point, and get to the finish line food and beverages early, weaseling out on the rest of the ride. I’m as surprised as anybody that I don’t give “The Weasel” route any real consideration, and ride straight onto Maury island. Which means I’m on the long ride, the full-mean deal, the big chihuahua, known as “The Idiot”. Checkpoints 14 and 15 (“Air Mail” and “? um. Rythmic gymnast?”) are dispatched reasonably quickly, and then the ride once again gets meaner. We are down near the water in the part of the island known as Docton. We do a long climb up the island, and then we have a very steep descent back down to the water. I refuel and rewater at the checkpoint, and start the climb out. It is stiff – an extended section in the 15-16% range. I have been tacking (riding back and forth across the road to make the climb less steep) on the steeper sections when practical and safe, and I continue it here. That pulls the effective gradient down to about 13%, and I slowly climb out at around 200 watts. I catch and pass a few people on the climbs (huh? I’m surprised to be catching people), and we descend down to Dockton – only to turn off and start climbing, up again, and then down to the water again. For the second double in a row. This one is a bit worse on the way out. Near the top of this one, I ask a rider with me, “How do you feel about profanity?”. She replies, “I don’t have a problem with it on a ride”. I pause, and then say, “I have *had it* with these motherfucking hills on this motherfucking ride” (reference). She laughs. There is only one checkpoint left. We start climbing, and it’s rolling, with a 10% base grade and short little uphills in the 14-15%. I see a sign to turn left, and as I get closer, I see a joyous sight; a car, and a group of riders standing around, which means this one is not going to be another double. A minute or so after this, Kevin pulls in, and we get our pictures taken in front of a vintage TdF climb picture holding a crystal cup. I eat a brownie. Then it’s a nice fast descent, a bit of spinning, and we’re back at the finish, where I pick up my finisher’s packet, eat a burrito that I would rather forget, and drink a mexican coke (sugar, not HFCS). And here is the elevation map. It was nuts. Truly nuts. As you can see, it’s there is perhaps 5 miles of flat(ish) the whole ride. I count 22 major climbs, and virtually all of them have sections in the 13% range. If you have done 7 hills, think of the worst hills on that ride – Seminary and Winery – and now think of doing each of them 11 times, except that some of them are steeper than either of those climbs. I felt pretty strong most of the way through – stronger than I’ve felt on a long ride the whole summer. Part of it was the weather; the cool definitely agrees with me. I also think that I ate more than I have in the past, and that helped out as well. Overall, the logistics around the ride were excellent. The yellow signs were clear in most cases, and it was nice not having to look for Dan Henry’s on the road. The food was good at the checkpoints, and there was nice variety. The volunteers were all helpful. 9/10, would ride again. The parking situation was a bit confusing. It would be nice to have something salty at the checkpoints and/or salt to put on the potatoes. The yellow P2P signs were very visible, but the arrows on them were hard to read until you got pretty close to them. I would prefer the arrows at the top of the sign, and either on the left, center, or right part of the sign, meaning left, straight, or right. 4PM is too early for the barbecue to end; I spent very little time in the checkpoints but still finished barely before 4PM. The burritos at the finish line were pretty underwhelming. It seems that the checkpoint locations weren’t well thought out – riders were often forced to ride a lot of extra distance and climb hills just to reach them.